Perhaps it is too early to get overly excited, but Spike can't help himself as he eyes a monsterfully powerful tropical cyclone developing off Madagascar. This purple people-busting marine melee - which has not been named yet but is set to be called Funani by my reckoning - has upgraded and slowed down to delay its entry into the open ocean. 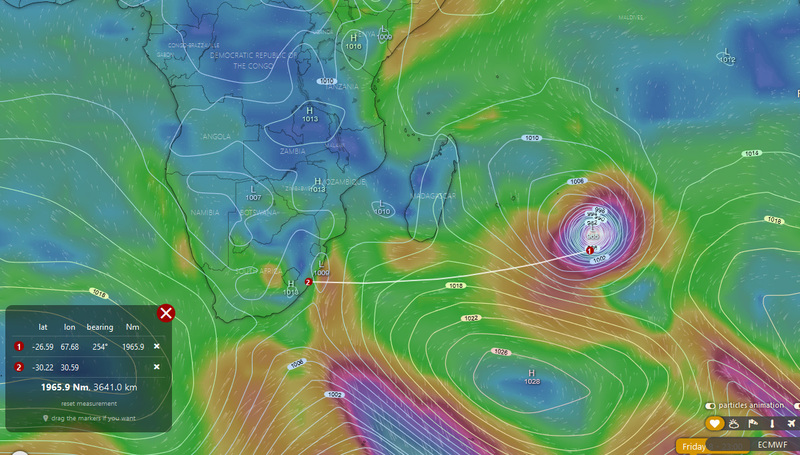 However, it looks to sit just off southern Madagascar, and according to the swell path's great circle track, should be in the zone to bring swell to Durban from Friday or Saturday 8 and 9 February with a central forecast pressure of a pert 965mb. 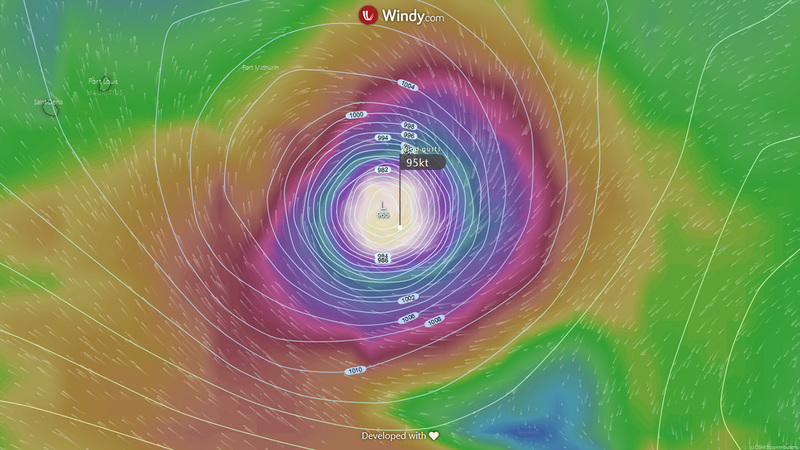 That's not overly punchy for the Roaring Forties, but considering this typically tight tropical wind gradient, we're looking at core wind gusts in excess of 100kts, or 3x galeforce. With winds at this speed, it's only duration of wind and length of wind fetch that need to align for us to get the maximum period swell that is physically possible when generated by surface wind on the ocean, which is around 23 seconds. By my reckoning, albeit at this early stage in the forecast cycle, the swells propagating from the storm could run at 40 foot x 23 seconds. The first part of the swell probably won't make northern KZN and Mozambique. These areas will probably have to wait for the storm to moved further south, but the coast from roughly Durban southwards should start feeling some swell. The sets will be travelling at a maximum speed of half the phase celerity, meaning actual velocity through the ocean of 35 knots. If you don't know what the hell that means, put your name down for my next swell course. For those who have done the course and remember it, you may know that the swell (depending on period and orginal size) can decay in size by up to 80 percent over 2,000 miles, but retains its exponentially potent speed and energy. Suffice to say that it will take 2-3 days to reach its target, New Pier, and it could be set for one of those extended and epic runs of pumping surf. Incredibly powerful, long-lulled, long-period sets to six foot or more should begin arriving Monday 11 February, with the main brunt of the swell rapidly building to 8-10 feet with Tuesday off the charts as the peak of the swell, but still firing Wednesday, pending the cyclone's movements a couple of days before, of course. It is slow moving, so don't be surprised if the surf cooks for a week. We may get more than we can handle on exposed coastThe Wave Watch III model - based on its algorithmic calculations - will likely put the initial ocean swell size at something along the lines of 80 degrees E direction, 12 foot at 22 seconds. That's a chunky swell to say the least, and we may get more than we can handle on exposed coast. However, if the storm continues to track southward, the filtering protection of the harbour breakwater will start coming into play as direction moves towards 100 degrees, or ESE. With a good chance that the storm would have been weakening as it moved into cooler waters, we could expect the swell to be tapering nicely to more manageable levels. In other words, the surf could be best in the beginning day or two and the end day or two, with the middle bits potentially too big. This is because initially Madagascar will block the biggest of the swell as the storm sits behind the big island for a couple of days without moving. Then we're in for a whack of high octane surf when it moves into open ocean, straight east of Durban, which might be out of control at many breaks. It could be going off its head on Valentines Day on Thursday 14 February. As I say, it's still early days, but wow, this one looks one to remember. It's could also be one to get the Cell C Goodwave guys interested.